Festival performers are subject to change or cancellation at any time without notice. The Event takes Place Saturday Oct 20th. Gates are at 1pm. Curfew 11pm. Set times can be found here. WHERE IS DEMON DAYZ FESTIVAL LA? WHAT SHOULD I NOT BRING TO DEMON DAYZ? • Bicycles, skateboards, rollerblades, scooters (motorized or push), hover boards, Segway’s. Please note – on site event security has final say on allowed and prohibited items. You can purchase tickets here. Tickets will be available at venue box office ONLY on day of event. I HAVE A QUESTION ABOUT MY ORDER OR WHEN MY TICKETS WILL ARRIVE? Please contact Frontgate at 888-263-9850. There will be plastic bags available for purchase at either entrance near the box offices. The festival is an all-ages event. Children 5 and under are free with paid admission. Collapsible strollers (1 per child with you) are permitted. Yes! Demon Dayz Festival is an all ages event. WILL THERE BE WATER FILING STATIONS? WILL YOU HAVE VEGAN AND GLUTEN FREE FOOD AND DRINK OPTIONS? Yes! Check back closer to the show for a list of vendors and offerings. There are no lockers available on the festival grounds. Please be sure to secure your personal belongs and do not leave items unattended. 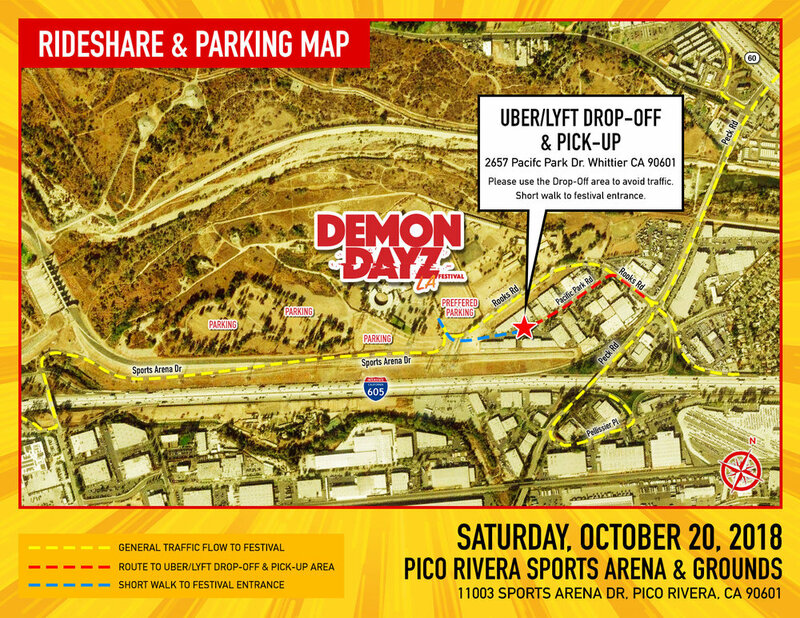 Demon Dayz, Live Nation, and Pico Rivera Sports Arena are not responsible for any lost or stolen items. WILL THERE BE A PLACE I CAN RECHARGE MY PHONE? Yes! Check back closer to show for a map demonstrating the exact location on site. Demon Dayz will go on! Rain or shine! WHAT ADA ACCOMODATIONS ARE AVAILABLE AT DEMON DAYZ? We suggest arriving early to secure an ADA parking space if needed. A state-issued accessible parking license plate, placard, or hangtag is required to park in this area. Demon Dayz will also offer an ADA viewing platform – please check in with our Guest Services staff near the main entrance for assistance upon arrival. • Clear Plastic refillable water containers up to one gallon in size. No metal or glass containers please. • Food/snacks may be brought in – one 1 gallon max size Ziploc-style bag per person. • Medications with a prescription and valid ID matching.